Autumn is well underway and the days are getting colder and colder already. You’re undoubtedly feeling a fair bit of crispness in the air in the early morning or after sunset, as days will grow shorter, hands will be thrust into pockets or wrapped around hot drinks to keep them warm during morning commutes—to work, to school, or even just walking the dog. 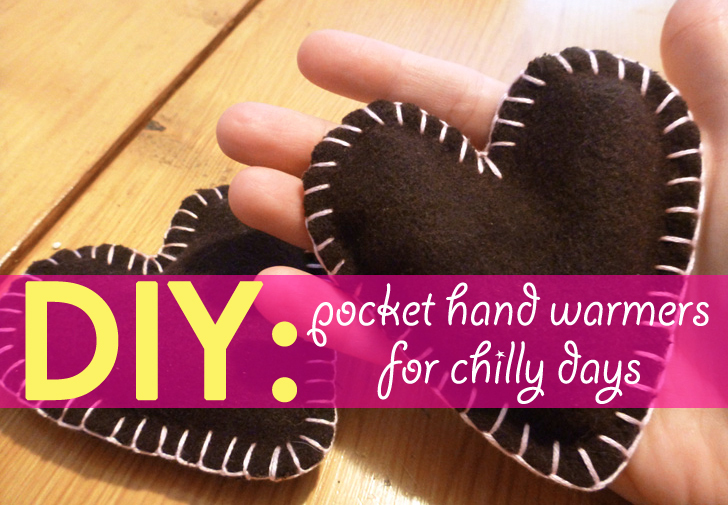 Soft fabric hand warmers are perfect for such chilly days, and can be tucked into pockets and mittens of all sizes. They’re super-easy to make, and you can decorate them in any way you like. These warmers are ideal projects for using up bits of scrap fabric, but it’s a good idea to use cloth that’s fairly insulating so it’ll retain heat for a longer period of time. Cotton flannel, heavy cotton, cotton fleece, woollen felt, and velvet are a few good fabrics to use, and this project is actually ideal for up-cycling flannel PJs, security blankets, or even old sheets. Note that you need to use natural fibres for this project, as putting synthetics in the microwave can melt them. If you’d like to use really cute fabric, get yourself a selection of color-coordinated cotton flannel “fat quarters”: squares of equal size that are used to make quilts. The colors and patterns will all work really well together, so you can create a fair numbers of these and either keep them in a bowl near your front door so family members can choose their own, or give them away as gifts. They actually make really great stocking-stuffers for the holidays, especially since they can pull double-duty as hot OR cold packs: just keep a few of them in the freezer to use as cold compresses for fevers and light injuries. 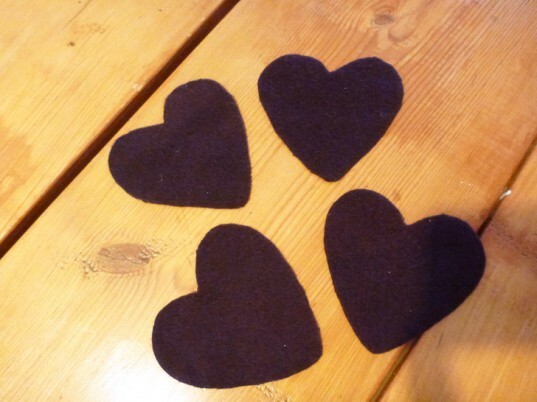 Take 2 pieces of fabric per warmer, and cut them into equal shapes/sizes. The easiest shape is just a rectangle or square, and you can make them a few different sizes to fit the hands of various family members. For adults, 4″ x 5″ rectangles seem to work well, while 3″ x 4″ sizes fit well into smaller hands. 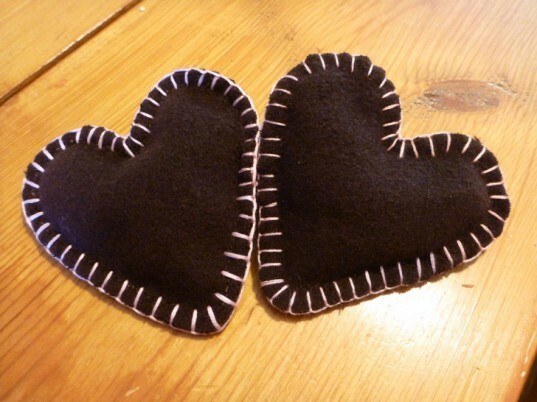 You can make them even tinier for wee kidlets, though the smaller sizes are best sewn by hand. I’d advise to clip the corners of the fabric for the sake of neatness, and to reduce bulk in those areas during the sewing process. 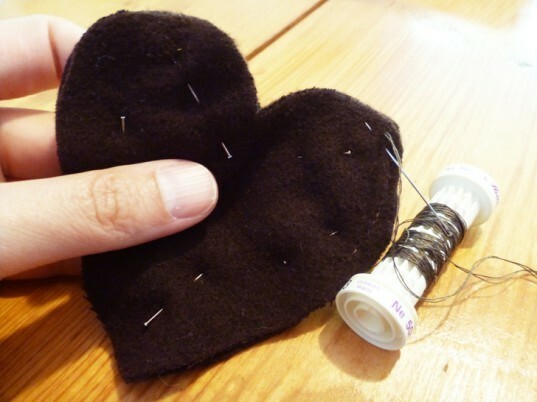 You can also create more interesting shapes such as hearts, flowers, or owls, and either embroider or sew details on them before stitching them shut. *Tip: You can use large cookie cutters as stencils for these shapes, and just trace around them with a fabric pen or chalk on the “wrong” side of the fabric. 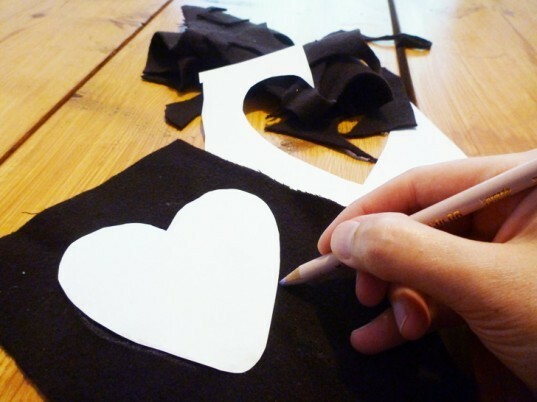 For unusual/unique shapes, just draw on pieces of paper, cut out the shapes, and trace around them onto your fabric. Once you have the pieces cut out, place their “right” sides together, and sew the seams 1/4 to 1/2 an inch from the edge of the fabric. If you’d like your seams to be invisible, use a straight stitch with thread that’s similar to your fabric color, and if you’d like the seam to be noticeable, use a zig-zag stitch with contrasting thread. 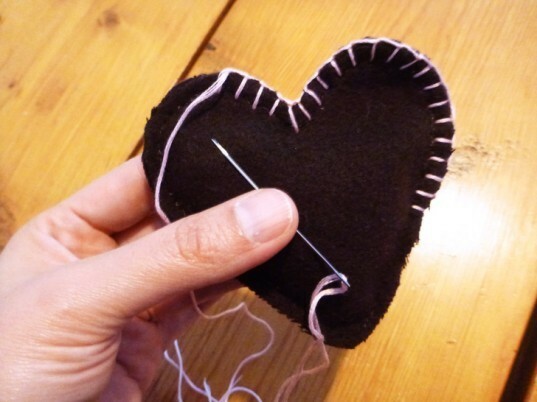 If sewing by hand, use a backstitch. Be sure to leave a 1/2-inch gap in the seam, preferably along one of the straight edges—not in a corner. Remember that gap you left? You can now use a crochet hook and/or knitting needle to push the inside fabric back through it so the warmers are right-side-out. 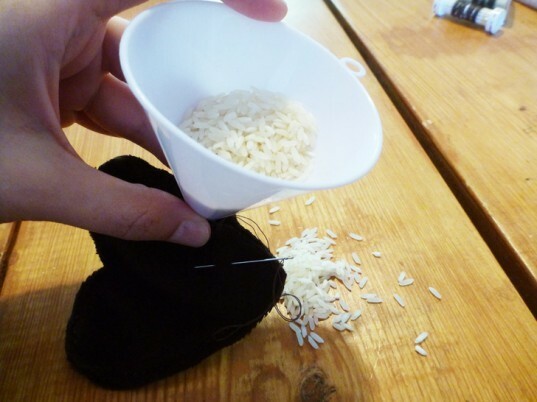 Once you’ve done that, pop the tube end of your funnel into the warmer and fill the bag with rice or barley. For kids’ warmers, use 1/4 cup of filler; for adult ones, you can use 1/2 to 3/4 cup, depending on the size you’re making. 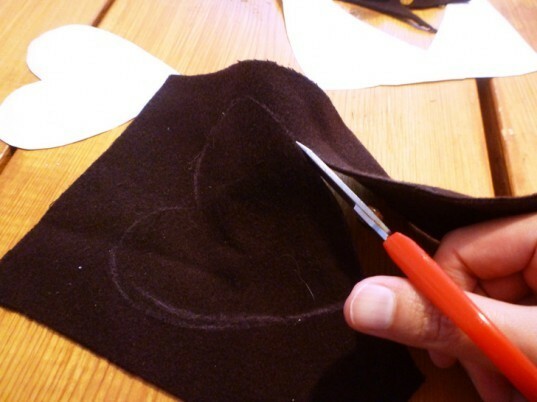 Use a straight pin to close the fabric, and then use a needle and thread to sew the gap closed. At this point, you can decorate the edges with a blanket stitch if you like, or add some lengths of cotton ribbon to either hang them up when not in use, or tie them together if they’re matched pairs. Pop these into the microwave for 30 seconds and then tuck them into your pockets or mittens. They can also be placed on a radiator to heat up—we actually put ours on top of the wood stove for 5-10 minutes before heading out into the chill with them. These really are wonderful for keeping hands warm on brisk days, and I’ve even popped them into the toes of my rain boots when doing yard work in autumn, as they work just as well on toes as they do on fingers. How long do these usually last kept in the pocket in the microwave for 30 seconds? I am wanting to make these just in case our power goes out this winter and was wondering if they would be okay being heated on a dry skillet over our gas stove? If so, which fabric should I use. Thank you! this is great however i was wondering, do you have to use a certain type of cloth? If so, what type? Autumn is well underway and the days are getting colder and colder already. You're undoubtedly feeling a fair bit of crispness in the air in the early morning or after sunset, as days will grow shorter, hands will be thrust into pockets or wrapped around hot drinks to keep them warm during morning commutes—to work, to school, or even just walking the dog. Soft fabric hand warmers are perfect for such chilly days, and can be tucked into pockets and mittens of all sizes. They're super-easy to make, and you can decorate them in any way you like.